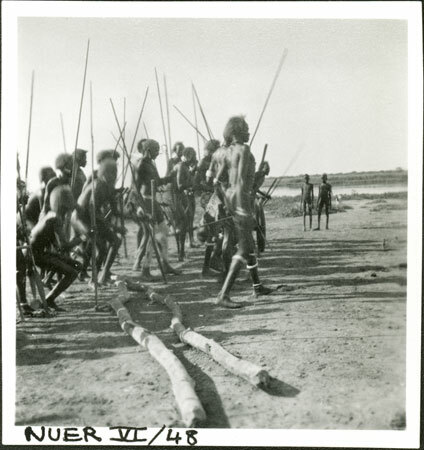 A group of men with spears, one with ash decoration on his legs, dance past the camera over two long poles, with the Sobat River in the background. The dancers are Lou men of Yakwach camp which Evans-Pritchard revisited in 1935. Note on print reverse ms pencil - "64 3 A144" & print front border ms ink - "NUER VI/48"
Morton, Chris. "A Nuer dance" Southern Sudan Project (in development). 03 Jan. 2006. Pitt Rivers Museum. <http://southernsudan.prm.ox.ac.uk/details/1998.355.271.2/>.